Grace suffered from low back pain, which resulted in leg weakness and difficulty walking. Her low back pain was seriously limiting her ability to function and enjoy life. Going shopping was painful. Moving around the house was painful. Lying down was painful. When Grace arrived at ACI Physical Therapy in Roxboro, Dr. William Nutt, PT, DPT created an individualized plan of care for Grace. Her included therapeutic exercise, manual therapy, neuromuscular rehabilitation, manual therapy, patient education and a home exercise program. 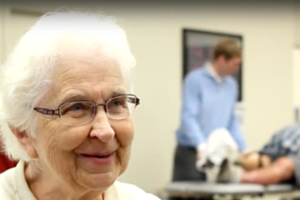 Grace says she quickly felt the results of her Physical Therapy treatments. She progressed to using a four-legged cane, then a regular cane. At discharge, Grace was table to walk pain-free without any assistive device. With help from ACI Physical Therapy, Grace reduced her low back pain, increased strength and mobility, and got back to enjoying life!